As the fight goes on to find a final resting place for Richard III I visited the Bosworth battlefield in Leicestershire. Members of Les Routiers De Rouen, the resident re-enactment group met me at the top of Ambion Hill near the Bosworth Battlefield Heritage Centre. 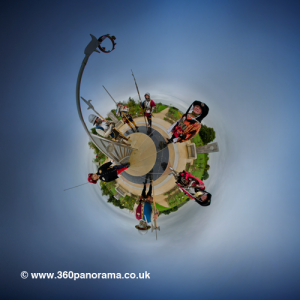 The site has a walk-through sundial which features the thrones of Richard III, Henry Tudor and Lord Stanley. They portray the Gloucester household personnel retinue to King Richard III, sworn to protect his honour and good name. They claim to be ‘devout yorkists and only serve the white rose and for our King we took the oath to stand to the last !’Les Routiers De Rouen are made up of people of all ages and from all walks of life and they were holding a Soldier’s Camp at The Bosworth Battlefield Heritage Centre and Country Park. Allowing visitors to meet medieval soldiers and families preparing for battle; with weapons, armour and costumes with the aim to give the public the experience of life in the 15th century. On Monday 4 February 2013, it was confirmed that the human remains excavated under Greyfriars car park were the remains of King Richard III, the last of the Plantagenet monarchs. Following the publicity caused by the find I covered several assignments at the dig site in Leicester city centre. As plans were now being made for tomb ‘fit for a King’ inside Leicester Cathedral I took a walk through the building on one of my trips. I discovered there has been a major memorial to King Richard in the Chancel since 1980 but I had not seen this on any reports about the discovery of the body. Richard III was killed at the battle of Bosworth on August 22nd 1485 and this stone has been the focus for remembrance, particularly on the anniversary of the battle. 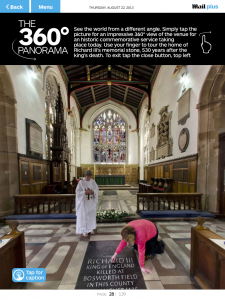 With the help of Cathedral staff I decided to shoot a 360 panorama of the Cathedral as they prepared for this years commemorations and this appeared in the Mail Plus for iPad app on the date. The memorial stone states that Richard was buried in the graveyard of the Church of the Greyfriars in the parish of St Martin (now the Cathedral). Shortly after the identity was confirmed the Very Revd David Monteith, the Canon Chancellor of Leicester Cathedral said: “On behalf of the Bishop and Acting Dean of Leicester, I want to say how very thrilled we are to be part of this amazing day. We are delighted with today’s news. We at the Cathedral and Dicoese share in the pride of serving such a great city as ours which still has the capacity to reveal such incredible stories. We applaud the skill, expertise and excellence of Leicester University which have led to this announcement. This has been a partnership from the start with the City Council, the University and the Richard III Society and we have been very pleased to co-operate with all the parties involved. I can confirm that the Cathedral have now received letters from both the City Council and Leicester University to further enact the requirements of the Licence which led to the exhumation of these human remains. 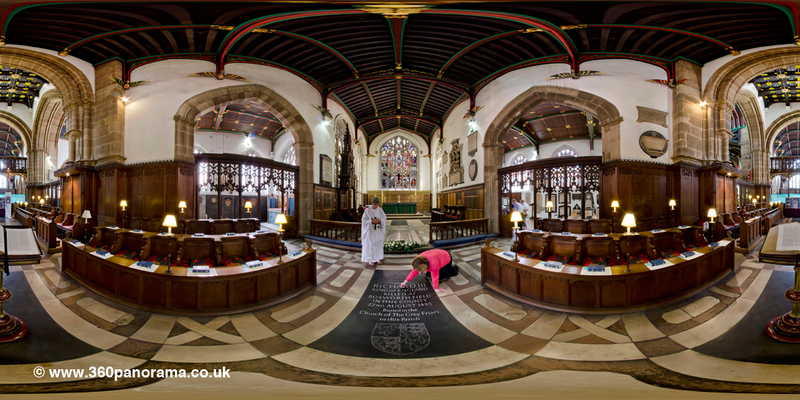 Click on the arrow on the image below to visit Leicester Cathedral and see the memorial stone.